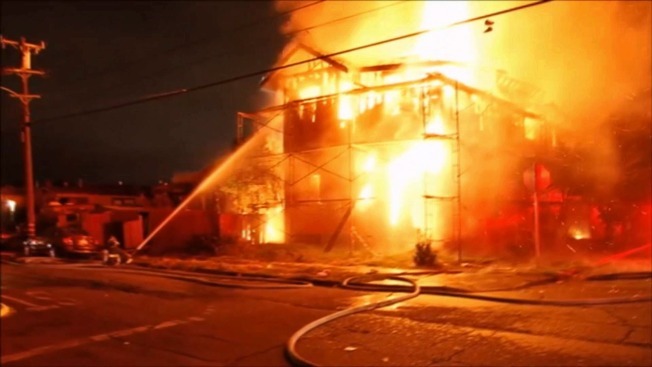 Fire engulfed an under-construction home in Oakland late Monday, according to fire officials. Bob Redell reports. A fire engulfed an under-construction house in Oakland late Monday, according to fire officials. The blaze ignited around 10 p.m. along the 2100 block of 57th Avenue, fire officials said. The two-story house, which was surrounded by scaffolding and did not have any electricity, was supposed to be vacant, but neighbors told fire crews that people may have been living inside the structure at the time of the fire, officials said. Two neighboring homes appeared to escape any damage. The cause of the blaze is not known at this time, according to fire officials. An investigation is underway.